described by the St. Louis Post Dispatch as "a magnificent pianist," is a collaborative artist at home in a multitude of diverse musical settings. Her playing is said to be, “...always precise with superb accentuation and warmth of feeling...”. Nina is a founding member of the Boston-based Calyx Piano Trio which has excited audiences throughout the United States with expressive ensemble playing and brilliant virtuosity. She has appeared in major concert venues throughout North America. She has performed with such ensembles as the St. Louis Symphony Orchestra, Boston Symphony, Boston Pops, and the Boston Modern Orchestra Project (BMOP), with whom she was a core member since its inception until 2007. Her festival appearances include those at Tanglewood, Banff, Norfolk, and the Skaneateles Festival. She has also appeared at the Carolina Chamber Music Festival and Missouri Chamber Music Festival where the Calyx Piano Trio holds residencies. Ms. Ferrigno is a graduate of New England Conservatory of Music, where she received degrees with distinction. Her principal teachers were Wha Kyung Byun and Randall Hodgkinson. 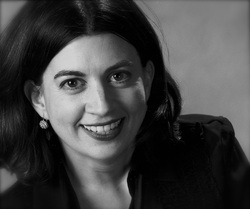 As a long-time member of the AUROS Group for New Music and member of the Calyx Piano Trio, Ms. Ferrigno is committed to bringing classical music to new audiences and expanding the repertoire by working with organizations including the Barlow Foundation to commission and perform new works in a variety of settings. The New Music Connoisseur has said of her, “pianist Nina Ferrigno [brings] out the inherent horizontal logic...all the while imparting sonic beauty from end to end.” Her chamber music recording of Lansing McLoskey’s “Tinted” was released by Albany Records in 2008 and her 2010 recording of Elliott Schwartz’s Chamber Concerto III: Another View for the BMOP Sound label was described as “wonderfully musical” by Fanfare magazine. Along with clarinetist Scott Andrews, Nina is Director of the Missouri Chamber Music Festival in St. Louis, and appears regularly with Chamber Project St. Louis.